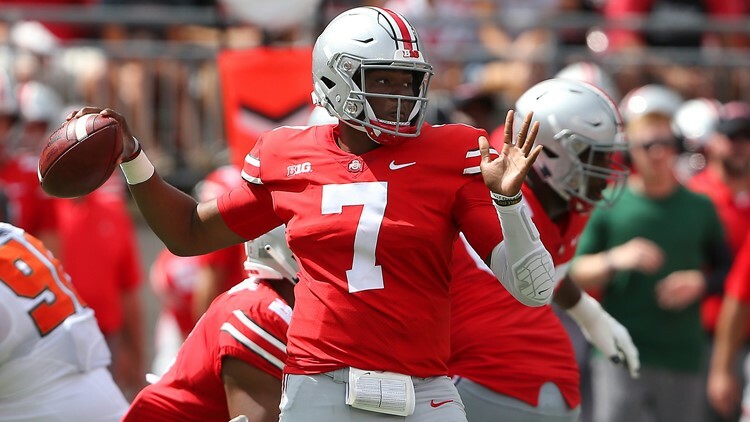 Ohio State Buckeyes quarterback Dwayne Haskins throws against the Oregon State Beavers on Sept. 1, 2018, at Ohio Stadium. in Columbus, Ohio. ESPN's College GameDay travels to Fort Worth, Texas, as the TCU Horned Frogs play the Ohio State Buckeyes in Arlington, Texas, at AT&T Stadium. The third week of the college football season has many questions. Journalists/wannabe college football insiders Mark Bergin and Lara Saavedra try to answer some of them. What’s your tweet-length reaction to Week 2 of the college football season? Mark Bergin: As expected, Herm Edwards and Arizona State are 2-0, while fellow new PAC 12 coaches Chip Kelly and Kevin Sumlin are 0-2 at their respective schools. Rutgers and Kansas play this upcoming weekend. Both teams enter with a 1-1 record. This means either Rutgers or Kansas will have a winning record after Week 3. Lara Saavedra: It seems like very few national pundits are mentioning that Oklahoma took a major hit Week 2 with the loss of starting running back Rodney Anderson due to a knee injury. This is Anderson's third season-ending injury with the Sooners. ***Honorable mention*** Mad props to Herm! Starting the season 2-0 at Arizona State - who woulda thunk?! Bergin: The Sun Devils enter Week 3 ranked No. 23, which is its first AP ranking since the 2015 preseason. Which Week 3 game are you most looking forward to? Bergin: No. 12 LSU at No. 7 Auburn at Jordan-Hare Stadium. You heard it here first: the Tigers will win! In all seriousness, the home team is 8-1 against the spread in this matchup since 2009. Jordan-Hare Stadium gives Auburn a tremendous advantage in this contest. Auburn enters the game as a 10-point favorite. The home team is 16-2 in the series over the last 18 years. It’s a battle of two transfer quarterbacks in Auburn’s Jarrett Stidham and LSU’s Joe Burrow. The result Saturday will likely help shape which team contends against Alabama in the SEC West this season. Saavedra: TCU versus Ohio State at Jerry World. This would be a statement game for No. 15 TCU if they can take down No. 4 Ohio State. Last time Ohio State played in Arlington, they won the National Championship but we’ll see. What’s the best college football team in the state of Florida? Bergin: Consider the honeymoon phase over for the homecomings of Florida’s Dan Mullen and Florida State’s Willie Taggart. Last weekend, Florida lost to Kentucky for the first time since 1986 and for the first time in Gainesville since 1979. The final score might show otherwise, but Taggart and the Florida State Seminoles nearly lost to the Samford Bulldogs, which plays at the FCS/Division I-AA level. FSU got embarrassed at home against Virginia Tech in Week 1. I’m about as confident as the Cowardly Lion at the start of the “Wizard of Oz” about my Florida power rankings. Saavedra: Flip a coin. Traditional blue-blood programs Florida, Florida State and Miami have been lukewarm at best. I guess I would go with UCF since they haven’t lost a game since Dec. 17, 2016. What’s the stupidest thing you’ve seen this college football season? Since we were just talking about Florida teams, FSU’s turnover backpack is almost as dumb as Tennessee’s trash can in the waning years of the Butch Jones era. Did I mention FSU nearly lost at home to an FCS school? The Seminoles didn’t take the lead over Samford until the 4:03 mark in the fourth quarter! I nearly lost it when I saw this “every game matters” commercial for the Big 12 while watching Kansas State get walloped by Mississippi State last weekend. First of all, the 30-second TV spot has annoying techno music that sounds like it was created by a middle schooler using GarageBand. Two of the first three teams featured in the commercial? Texas: The Longhorns lost to Maryland for the second year in a row. Maryland is the definition of Big Ten mediocrity, going 10-24 in conference play since joining the league in 2014. Kansas: The Jayhawks have the longest bowl drought among Power 5 Conference teams and just won their first road game since Sept. 12, 2009. It’s also worth pointing out the Big 12 is 2-4 entering Week 3 against other Power 5 Conference opponents this season. I don’t even think the creators of the commercial agree with its message! This could be a reason why the Big 12 has struggled to put teams in the College Football Playoff. Unless TCU knocks off Ohio State, this commercial is a complete lie. A Big 12 team hasn’t won a national title since Texas beat USC on Jan. 4, 2006, in the Rose Bowl. Oklahoma will continue to serve as the conference’s only blue-blood program unless West Virginia quarterback Will Grier decides he wants to win the Heisman Trophy. However, the Mountaineers have a brutal four-game stretch to end the season on the road at Texas on Nov. 3, hosting TCU on Nov. 10, at Oklahoma State on Nov. 17 and then hosting Oklahoma on Nov. 23. The AAC has pushed the "Power Six" narrative due its success on the gridiron the past five years. The conference is 3-0 in New Year's Six bowl games, including UCF's win over Auburn in the Peach Bowl last season. The problem is financial with the College Football Playoff only taking four teams, at least for now. The Memphis Commercial Appeal reports the AAC reported a little less than $75 million in total revenue for the 2016-17 fiscal year, which is considerably less than the Big 12 ($371 million) and miles behind the SEC ($650 million). The AAC needs to continue to garner high TV ratings, but it consistently draws less viewers than the other Power 5 Conference teams. The data shows the casual college football fan doesn’t care about the AAC as much Power 5 Conference teams. We’ll see what kind of media rights deal the AAC can fetch once its current contract runs out in 2020. If at least one team from the Power 5 is left out of the College Football Playoff each year (remember the SEC had two teams in with both Alabama and Georgia), why would the CFP committee allow for an AAC team to get in, especially if the AAC team doesn’t draw high ratings? It comes down to basic capitalism for college football. The only way a legitimate argument for the “Power 6” to get legs would be for the CFP to expand. ESPN’s College GameDay heads to Fort Worth, Texas, this weekend for TCU vs Ohio State even though the game will be played at AT&T Stadium in Arlington. Which team will Lee Corso pick? Bergin: Despite being a 13-point favorite, I can imagine the outrage on Twitter if Corso picks the Buckeyes on the road considering the three-game suspension to head coach Urban Meyer. I think he’ll pick TCU. Saavedra: It’s essentially a home game for the Horned Frogs and Gary Patterson will have them ready to play. It’s worth noting that the Frogs are 6-0 when they are a part of the GameDay festivities. Note: ESPN will broadcast College GameDay from the TCU campus in Fort Worth, but the game between the Horned Frogs and the Ohio State Buckeyes will be played at AT&T Stadium in Arlington.